Canyon was making rhythms with spoons long before he learned to eat with them. In fact, everything he held in his hand was a drumstick, and everything in his sight, a drum. He loves music. Period. Topping the list: rock & roll. On his first day of kindergarten, his biggest fear wasn't that he'd be missing his mom, but that there would be no rock & roll. He has a greater knowledge of 70s and 80s rock bands than many of us who grew up during that time. His name is Canyon Blue. 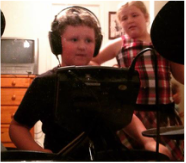 He is 8-years-old, and he may be the epitome of the quote, "Music is not what I do... it is who I am." Canyon Blue playing his new drum set. He had a Christmas he'll never forget, thanks to everyone who donated! "Through Music And The Arts, Every Child Has A Voice." I work with a very small, very new (we finally, after almost a year wait, received our official IRS 501(c)(3) designation last month), very wonderful, non-profit organization called The Inspire Foundation, with a mission to bring music education to special needs kids in the Pinellas, Pasco, Hernando, and Hillsborough Counties area, and ambitions to grow nationally. 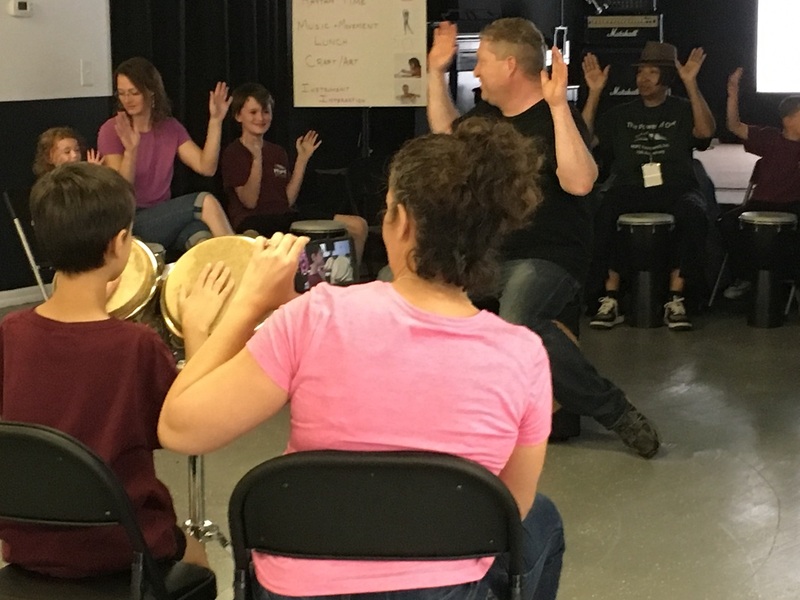 We've been doing some initial fundraising and Jason and Cristine were recently able to spend time sharing their talents, music and musical instruments with Camp Coast, a summer day camp sponsored by the local YMCA specifically for children with autism and developmental disabilities. Today I had the honor and privilege of meeting an exceptional young teenager named Kindle. Kindle is special, but it is not Kindle’s special needs or being on the spectrum that make her so extraordinary. Kindle is polite, poised, articulate, musically gifted, and passionate about being her own best advocate. During our interview she told me her mother, Sherry, encouraged her to try the violin. Sherry, whose son is also on the spectrum, later told me she had specifically wanted Kindle to learn violin because she had read research indicating the higher frequencies of the violin had positive influence on developing neural pathways. It was a good match. For the last 3 years, Kindle has been excelling, playing with her schools orchestra, composing, and receiving Superior marks at District Championships. She told me how playing the violin helped her channel her emotions, happiness, joy, anger, all the things a normal teenager feels, the very same things most teenagers normally have a hard time expressing. She plays confidently and beautifully. Here’s the bad news: Kindle has not had or been able to play a violin for the last few months. Her music and orchestra teacher had to retire due to health issues, and the school chose to cancel the orchestra program rather than hire a new teacher. Without the school’s orchestra, the small fee school loaned instruments, and lessons, it has been a very quiet Summer at her house. Now for the good news: Remember I told you Kindle in her own words described herself as her own best advocate? This amazing young women took up the challenge and the initiative and started searching for alternatives to her music education and found The Inspire Foundation. Even though she thought we only helped little kids (we help all special needs kids), she called us up anyway, all on her own, and shared her story with us. We fell in love. Today The Inspire Foundation, in our first official presentation as a non-profit, with her two best friends and her entire family gathered, surprised Kindle with her very own violin, bow, case, and all the accessories she needs to start playing again. It was magical. Watching Kindle’s smiles and excitement as she played beautifully for us for the first time in months, is the best feeling I've had in a very long time. Her mother already has some great leads on lessons, and now that Kindle has her own violin, she can pursue Youth Orchestra, where I've no doubt with her positive can do attitude, she will become a leader. Kindle has musical ambitions and dreams for her future. With her special abilities, I've no doubt she will achieve them, and I look forward to following her progress in the years to come.Today was a really great day. From the bottom of our hearts, Thank You Kindle! We met Brea when she was 17 years old. Her mother wrote us a letter on her behalf. Brea, is on the spectrum and is an artist. Her favorite and best medium is drawing. Sadly, she had to be taken out of the mainstream population in 8th grade. Brea was a member of the Junior Honor Society Art Club in Middle School before she was transferred. 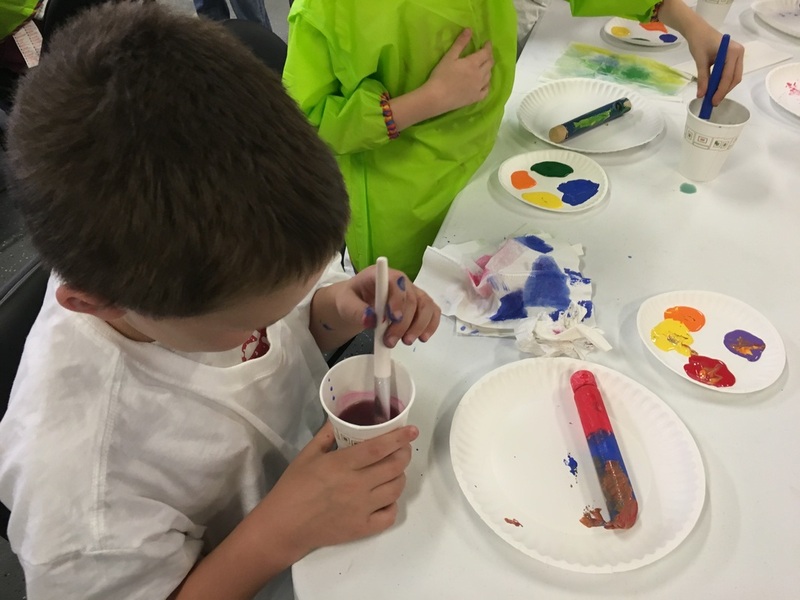 There is an art class at her new school, but it is a general elementary art class that isn't challenging her talent enough. We were very moved by her story and her beautiful artwork. With the help of Brea's mom, we scheduled a meet and greet between her and a few members of our foundation. However, we had more on the agenda than just a meet and greet. We went on a shopping spree at a local Michael's on Brea's behalf. 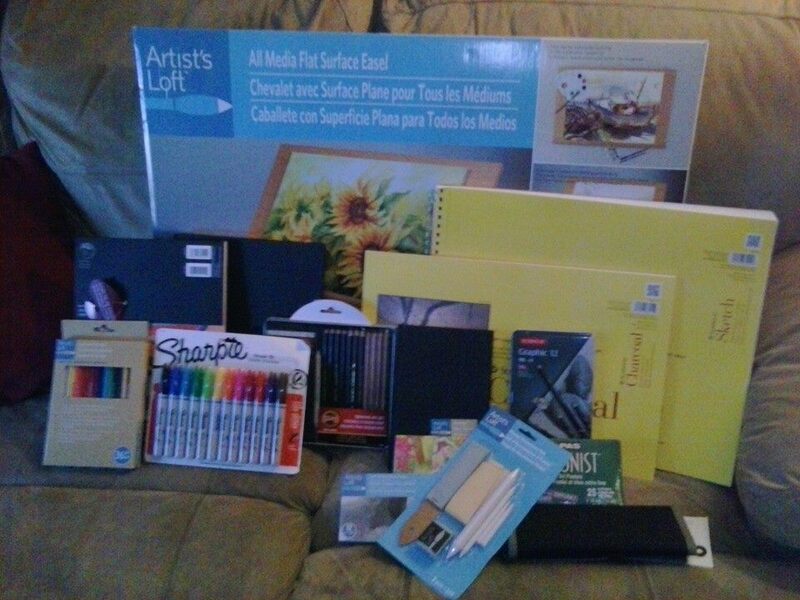 We wanted to make sure she would have everything needed to continue her passion in art/illustration. Our mission didn't end there, though. After meeting Brea in person, we became inspired to do more. That is when when we knew we needed to expand our mission to also focus on helping young adults learn how they can turn their passion into their future. Since our first meeting with Brea, we have also helped her acquire a desk top computer so she could learn and work with the graphic programs needed to further her art career. 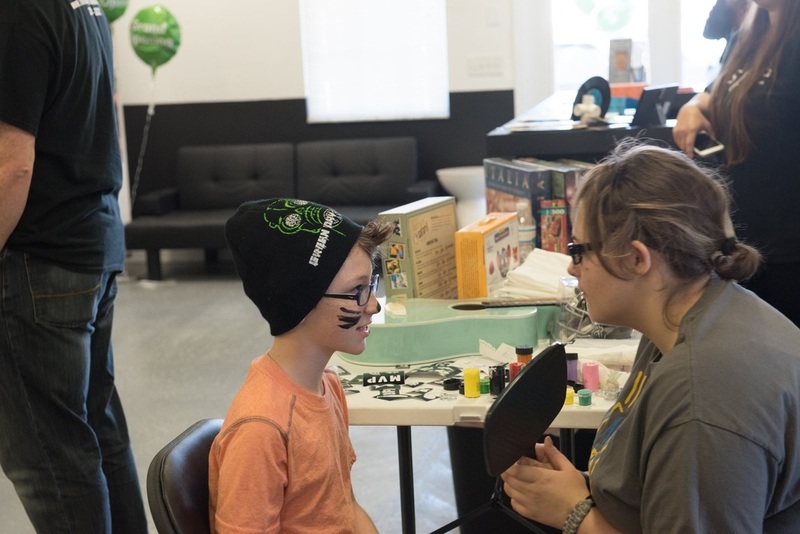 Brea volunteering for Inspire by providing face painting at one of our events. The Inspire Foundation's donation to Brea. The Inspire Foundation named their scholarship after Gehrig, the first recipient of the Gehrig Scholarship. This scholarship was created to help fund private music and art lessons for children with autism and all other pervasive developmental disorders. 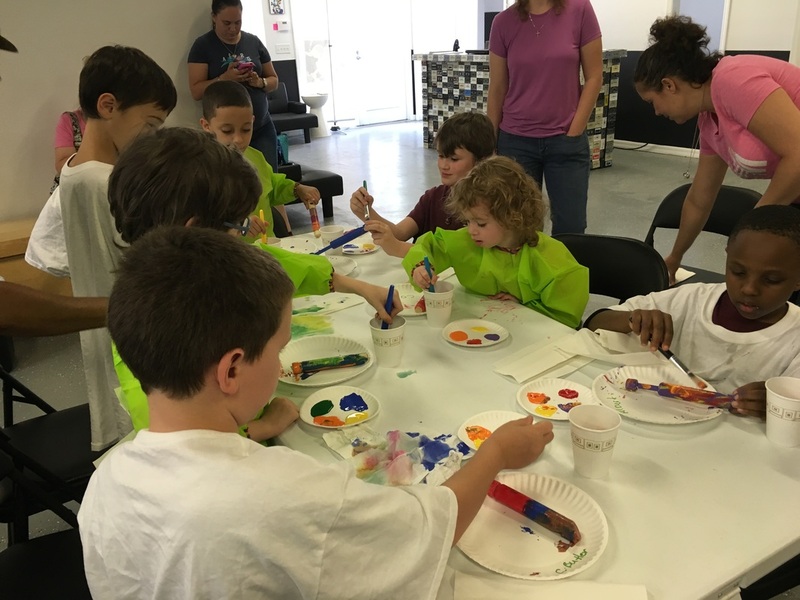 It has now expanded to fund group classes in music, art, martial arts, and dance, at select locations in your community. Through fundraising efforts and private donations, this scholarship will enable The Inspire Foundation to carry on their mission to ensure that every child has the opportunity to explore their own talent and interest in music and the arts. Our foundation met our next recipient by chance. 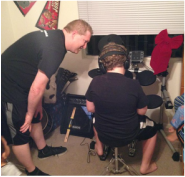 Co founder, Cristine Rhodes was on social media and saw a request for "Instruments to purchase for my musically savant daughter with Autism" on a classifieds group. She new immediately that she needed to reach out to this mom and inform her of Inspire's services. After watching videos of Maya sharing her gift of music and many exchanged messages between Cristine and her mom, the rest of our B.O.D. became inspired. The Inspire Foundation acquired a violin, flute, banjo, and clarinet to help further Maya's natural musical talent. Project Looking Ahead is a program for young adults with special needs. 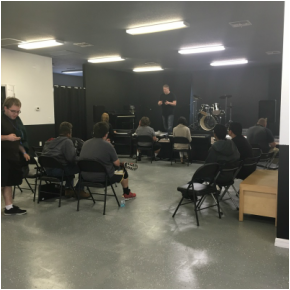 Once a month The Inspire Foundation works with theses individuals teaching them about the music industry. 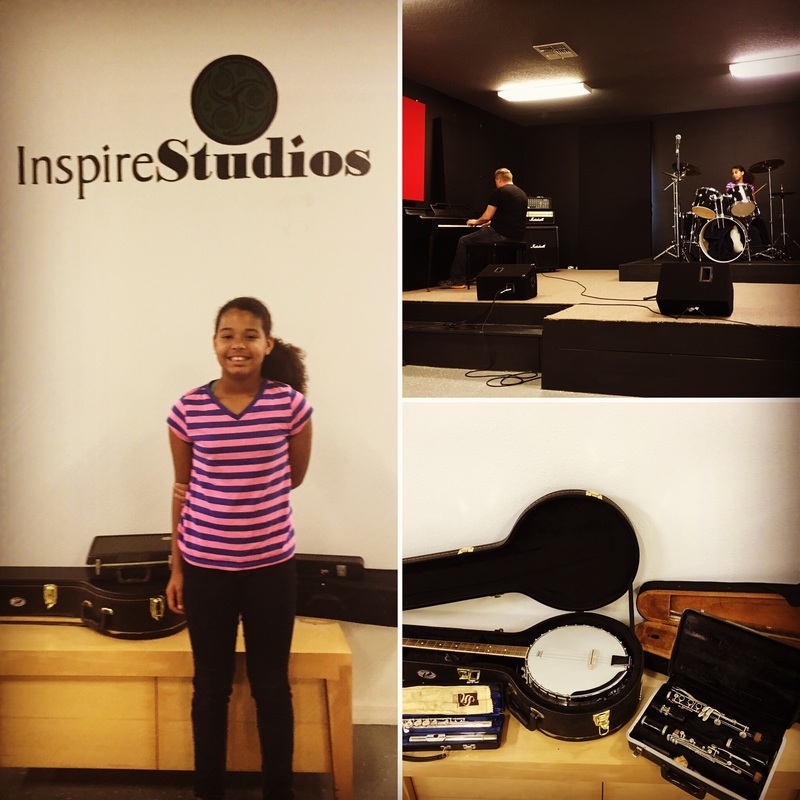 The Inspire Foundation provides a free monthly music class for all ages the second Saturday of every month. We have served hundreds of people with this program throughout the Tampa Bay area.